Last October’s 3xCD ‘Versus’ album was a huge undertaking for John Digweed and Nick Muir and and as part of the package the Bedrock duo teamed up with a number of artists to create 12 exclusive new tracks. Some of the biggest house and techno talent around became involved - Christian Smith, Wehbba, Pig&Dan, Marco Bailey, Henry Saiz, Guy J, The Japanese Popstars, Carlo Lio, Jamie Stevens, Ian O’Donovan, Second Hand Satellites, Jozif and Psycatron – joining forces with the duo for this highly creative project, to produce yet more tracks for the label. Now, Bedrock is developing the 'Versus' project further, with a series of single releases that see John & Nick invite a new group of artists to give their creative take on the original album tracks. First up was Extended Play, who got to grips with ‘Morphism’, the collaboration from John Digweed & Nick Muir Vs. Pig&Dan. 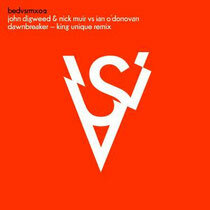 The next release has King Unique twisting the knobs of creativity and breathing a new life into ‘Dawnbreaker’, from John Digweed & Nick Muir Vs. Ian O’Donovan. The fizzing melodic techno of the original version has been given the full King Unique treatment here, with Matt Thomas keeping the melodic beauty intact and giving the track a taste of his highly original trademark combination of delicious underground house and tripped-out cosmic techno styling. Great site. A lot of helpful information here. I am sending it to several buddies ans additionally sharing in delicious. And naturally, thank you to your effort!